Saw a very nice holster and speedloader pouch set. Upon inquiry, I found it to be yet another Michael Hast design. The pictures don’t really do it justice. 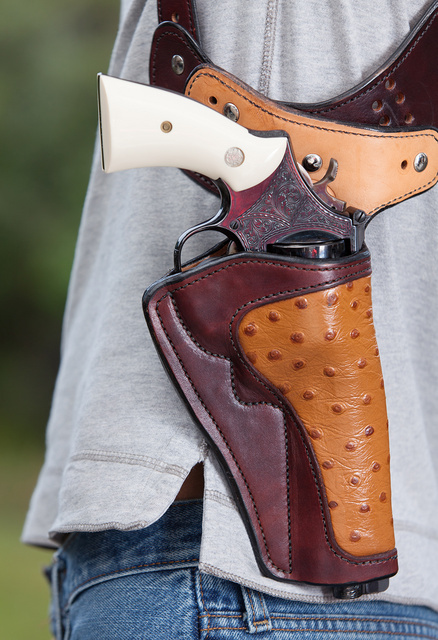 The leather is worthy of the gun it encases, S&W M27. This entry was posted in holster, pistol and tagged 357Mag, leather, revolver. Bookmark the permalink. Any idea who did the engraving? I found the gun at a local gun shop here in Florida and the engraving was already present on the gun so I can’t shed any light on the origin of the engraving. Do you have any single sisters? Looks like Ostrich on the holster too. As a “historical” style rig, it’s fine. But I have quibbles about the holster design. Speedloader pouches are being worn in he wrong position & direction. Imagine trying to access them where they are whilst wearing a suit jacket or a winter overcoat. You’d be trying to get the loaders out against the sleeve/shoulder of the jacket. Not good. Even if the pouches are reversed, the position is going to “print” with a bulge at the front of the jacket or coat. And with a cover garment in place, your strong hand would still have trouble reaching that area easily, meaning having to use the weak hand (which is probably holding your empty gun after ejecting the brass). 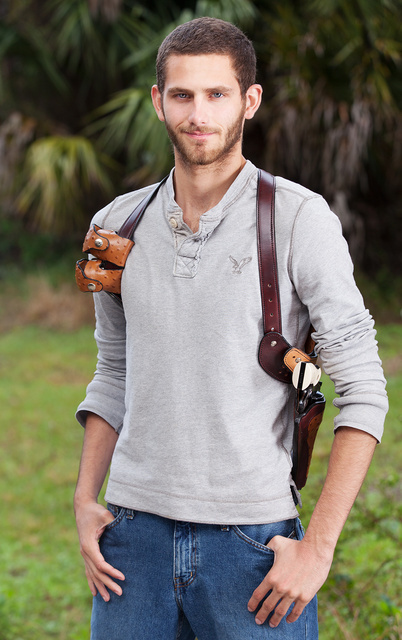 With no tie-down to a belt (or even a suspenders clip to the pants) the gun & holster can move outward during wear (walking) and reveal its presence. 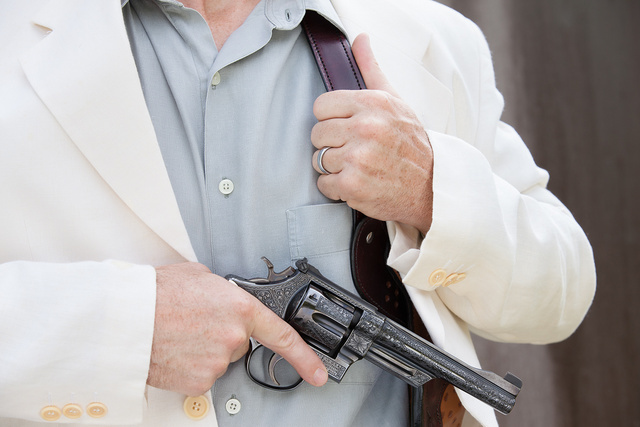 It can also make the draw slower if a quick grab causes the holster to move with the gun. It would be instructive to see where the straps cross in the back. Many rigs fail where the straps form the “X” in back, leaving a distinctive print through the cover garment. What BillCa says. Move the reloads and put a tie down at the bottom end and you have something. ‘Course a tie down could be a problem with that un-tucked shirt. Anyway, one of our employees has taken to wearing a shoulder rig full time. He likes it because, among other things, it doubles as a pair of suspenders. His reloads are tucked underneath, same as the gun, on the opposite side. A loose-fitting shirt covers the whole shebang pretty well, and a jacket totally. I might suggest the model in the top photo is wearing the speedloader carriers in a location to assist the photography, and not in a carry location. Given the level of artisanship, I am glad to better see them.